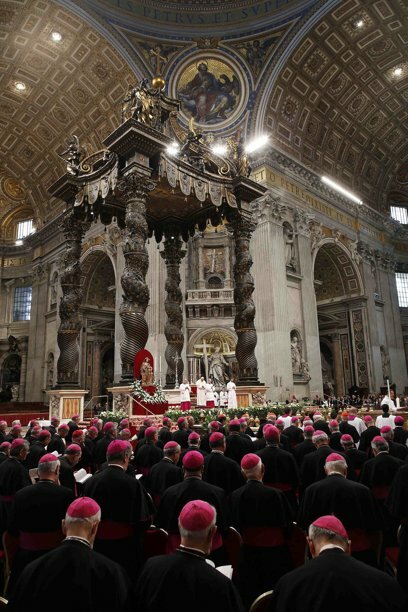 At the close of the Italian bishops' plenary this week in Rome, the home-bench – led by its primate, the Pope – gathered in St Peter's tonight to make a communal Profession of Faith as part of the ongoing Year of Faith. The event marked Francis' first full encounter with the powerful Italian conference, known as the CEI. While the event ranked as a liturgical occasion – and the Sistine Choir and ceremonies crew all donned choir dress – Papa Francesco and the prelates wore the simple "house cassock," which has been the new pontiff's invariable daily wardrobe since his election for everything but Masses. Following the rite, meanwhile, instead of the long-standing custom of prelates queueing up to pay their respects to the Pope at his throne, Francis spent well over a half-hour snaking through the multiple rows of seats in front of the main altar alone, warmly greeting the bishops one by one at their places. While the bishop of Rome enjoys the status of primate of Italy, the CEI is led by a president appointed by the pontiff – currently Cardinal Angelo Bagnasco of Genoa, who was said to be a compromise choice on his selection in 2007. 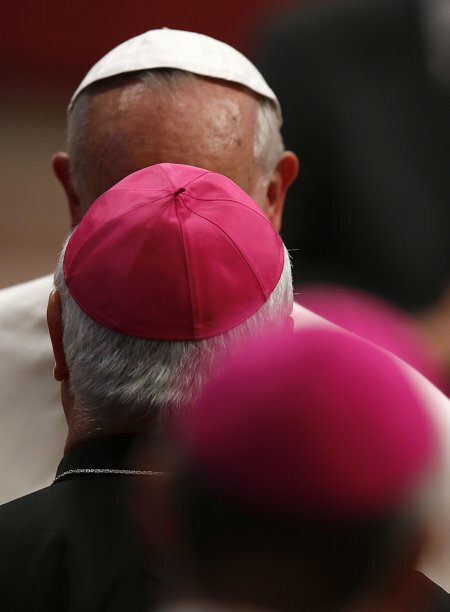 In what would be a significant change to the custom, early speculation shortly after the March Conclave indicated that the new Pope was leaning toward letting the bishops choose their own chief, but no movement in that direction has since emerged. 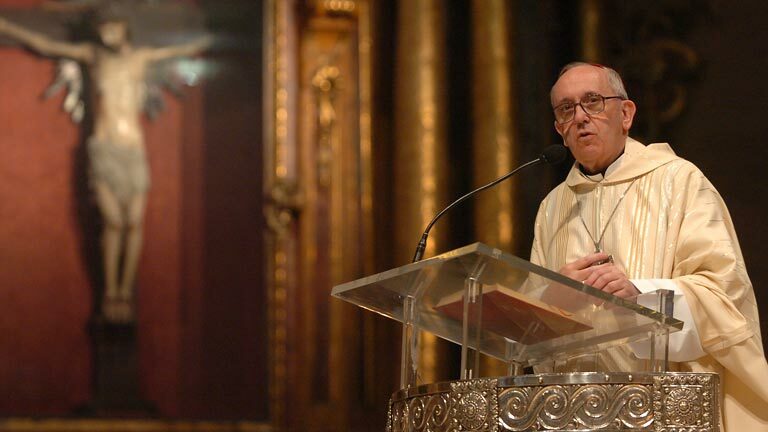 Himself a two-term president of the Argentine bishops, before the Creed was assented to in the Q&A form usually kept for the renewal of baptismal promises at Easter, Francis delivered the following allocutio, here in its Vatican Radio translation. The readings we have heard make us think. They have made me think a great deal. I have made something like a meditation. For us bishops, and first of all for me, a bishop like you, I share it with you. It is significant - and I am particularly happy - that our first meeting should be held right here in the place that preserves not only the tomb of Peter, but also the living memory of his witness of faith, of his service to the truth, and of the gift he gave of himself – to the point of martyrdom – for the Gospel and for the Church. This evening this altar of the Confession becomes our Lake of Tiberias, on the shores of which we listen to the wonderful dialogue between Jesus and Peter, with the question addressed to the Apostle, but which should resound in our own hearts, the hearts of bishops. The question is addressed to a man who, despite his solemn declaration, was overcome by fear and went back on his word. The question is addressed to me and to each one of you, to all of us: if we avoid reacting too hastily and superficially, it encourages us to look within, to enter into ourselves. He who searches hearts (cf. Rom 8:27) makes himself a beggar of love, and questions us on the only really essential question, the premise and condition for pastoring his sheep, his lambs, his Church. Every ministry is based on this intimacy with the Lord; to live in him is the measure of our ecclesial service, which is expressed in an openness to obedience, to emptying of self, as we heard in the Letter to the Philippians, to total giving (cf. Phil 2:6-11). Moreover, the consequence of loving the Lord is giving everything - absolutely everything, even one’s very life - for Him: this is what must distinguish our pastoral ministry; it is the litmus test that shows how profoundly we have embraced the gift received in response to the call of Jesus, and how we are joined to the people and the communities that have been entrusted to us. We are not expressions of a structure or an organizational need: even with the service of our authority we are called to be a sign of the presence and action of the Risen Lord, and so, to build up the community in fraternal charity. Not that this is taken for granted: even the greatest love, in fact, when it is not continuously fed, fades and goes out. Not without reason the Apostle Paul warns: “Take heed to yourselves and to all the flock, in which the Holy Spirit has made you overseers, to care for the Church of God which he obtained with the blood of his own Son”(Acts 20:28). The lack of vigilance - we know – makes the Pastor lukewarm; he becomes distracted, forgetful and even impatient; it seduces him with the prospect of a career, the lure of money, and the compromises with the spirit of the world; it makes him lazy, turning him into a functionary, a government clerk worried more about himself, about organisations and structures, than about the true good of the People of God. 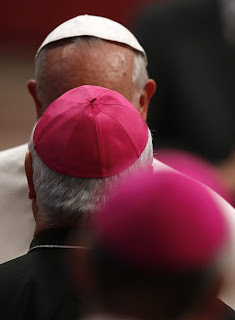 He runs the risk, then, like the Apostle Peter, of denying the Lord, even if he is present to us and speaks in His name; the holiness of the hierarchy of Mother Church is obscured, making it less fertile. Who are we, Brothers, before God? What are our challenges? We all have so many, each one of us knows his own. What is God saying to us through them? What are we relying on to overcome them? As it was for Peter, the insistent and heartfelt question of Jesus can leave us saddened and may leave us more aware of the weakness of our freedom, beset as it is by a thousand internal and external constraints, which often cause confusion, frustration, even disbelief. These are certainly not the feelings and attitudes that the Lord intends to arouse; rather, the Enemy, the Devil, takes advantage of them to isolate us in bitterness, in complaints, and in discouragement. Jesus, the Good Shepherd, does not humiliate us or abandon us to remorse: in Him, the tenderness of the Father speaks, He who comforts and raises up; He who makes us pass from the disintegration of shame – because shame surely causes us to disintegrate – to the fabric of trust; who restores courage, recommits responsibility, and consigns us to the mission. Peter, purified by the fire of forgiveness, can humbly say, “Lord, you know everything, you know that I love you” (Jn 21:17). I am sure we can all say this from the heart. In this Peter, purified, in his first letter exhorts us to feed “the flock of God that is your charge, not by constraint but willingly, not for shameful gain but eagerly, not as domineering over those in your charge but being examples to the flock”(1 Peter 5,2-3). Yes, to be pastors means to believe every day in the grace and strength that comes to us from the Lord, despite our weakness, and to fully assume the responsibility of walking in front of the flock, freed from the burdens that hinder a healthy apostolic swiftness, and without hesitation in leading, to make our voice recognizable both to those who have embraced the faith, but also to those who are “not of this fold” (John 10:16): we are called to make our own the dream of God, whose house knows no exclusion of persons or nations, as Isaiah prophetically announced in the First Reading (cf. Is 2:2-5). Therefore, being pastors also means to be ready to walk in the midst of and behind the flock: capable of listening to the silent story of the suffering and bearing up the steps of those who are afraid of not succeeding; careful to raise up, to reassure, and inspire hope. By sharing with the humble our faith always comes out strengthened: let us put aside, therefore, any form of arrogance, to incline ourselves toward those the Lord has entrusted to our care. Among these, a special place is reserved for our priests: especially for them, may our hearts, our hands, and our doors remain open at all times. They are the first faithful we bishops have, our priests. Let us love them! Let us love them from the heart! They are our sons and our brothers. Dear brothers, the profession of faith that we now renew together is not a formal act, but is a renewal of our response to the “Follow Me” with which the Gospel of John concludes (21:19): allow your own life to unfold according to the project of God, committing your whole self to the Lord Jesus. From here springs that discernment that recognises and takes on the thoughts, the expectations, and the needs of the men of our time. With this in mind, I sincerely thank each of you for your service, for your love for the Church and the Mother, and here, I place you, and I place myself, too, under the mantle of Mary, Our Mother. that we might return to the freshness of the beginning, for a praying and penitent Church. Intercede with your Son that our hands, our feet and our hearts may be swift: that we may build the Church with the truth in charity. And [that] we will be the People of God, on pilgrimage towards the Kingdom. Amen. I am sending these lines of greeting and also to excuse myself for being unable to attend due to "commitments assumed recently" (sound good?). I am spiritually with you and ask the Lord to accompany you very much during these days. I express to you a desire. I would like the Assembly’s works to have as a frame of reference the Document of Aparecida and “Go into the Deep.” The guidelines are there that we need for this moment of history. Above all I ask you to have the special concern to grow in the continental mission in all its aspects: programmatic mission and paradigmatic mission. May the whole of ministry be in a missionary key. We must come out of ourselves to all the existential peripheries and grow in boldness. I wish all of you this joy, which so many times is united to the Cross, but which saves us from resentment, sadness and clerical [solitude]. This joy helps us to be each day more fruitful, spending ourselves and unraveling ourselves in the service of the holy faithful people of God. This joy will grow increasingly to the degree that we take seriously the pastoral conversion that the Church asks of us. Thank you for all that you do and for all that you are going to do. May the Lord free us from making up our episcopate with the tinsel of worldliness, of money and of “market clericalism.” The Virgin will show us the way of humility and that silent and courageous work that carries apostolic zeal forward. I ask you, please, to pray for me, [so that I won’t be puffed up] and so that I will be able to hear what God wants and not what I want. I pray for you. A brother’s embrace and a special greeting to the faithful people of God that you have in your care. I wish you a holy and happy Eastertide. Speaking of plenaries, the US bishops' spring meeting begins on June 10th in San Diego. Keeping with the conference's longtime schedule, the plenary's sole agenda will be the bench's three-yearly communal retreat, its focus on the new evangelization. No formal conference business will take place. In November, the body will elect Cardinal Timothy Dolan's successor as its president... and more on that later.